Welcome to “The Self-Worth Challenge”. How we feel about ourselves is a very big and worthwhile topic. I believe everyone has value to bring to this world. Through many years of working with people as a counsellor I have seen how taking time to develop our self-worth is incredibly beneficial. For this reason over the next 7 weeks I will be writing a post on aspects of self-worth with activities you can use to explore and further develop your own sense of value. Each post will comprise of some discussion and thoughts on the weeks topic followed by a few questions or an activity. These are designed to help you consider your own self-worth and take the next step to strengthening this all important aspect of your life. Why Is It Good To Work On Valuing Ourselves? The power of valuing ourselves and really knowing what we bring to the world should never be underestimated. When we truly acknowledge our strengths we approach life significantly differently to when we don’t. Any improvement in our self-worth impacts our lives in so many ways, more than I could ever list, but here come a few. It becomes easier to speak up for ourselves. It helps us to value ourselves and others for our similarities and differences. We can utilise our strengths fully and go for what we want in life. Even when we do have a good sense of self-worth, exploring how we can continue to develop it and really own the talents we have, only empowers us more. Once we are parents valuing ourselves as much as we can is so important. Our children learn from us and through us. They don’t just do what we say but they learn very fundamentally from how we are. 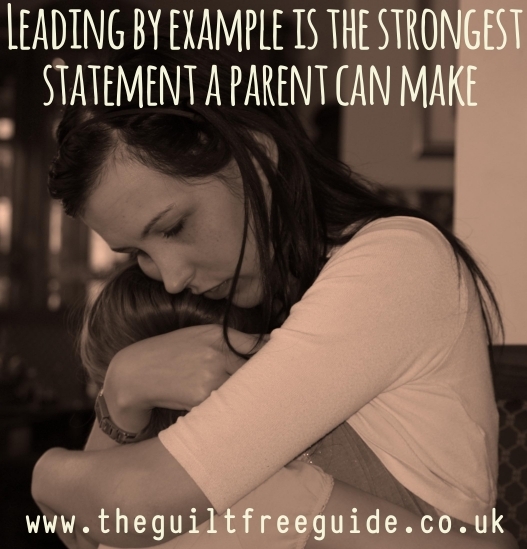 Leading by example is the strongest statement a parent can ever make. Tips and tricks to get our children to think well of themselves will help. We can give them information that we might never have received in childhood. But the strongest demonstration for our children is how we live our life and how we feel about ourselves. It Surely Can’t Be Good To Think Highly Of Ourselves? As a society there are some fears around this topic. There are fears that if we acknowledge those good things in ourselves then we could become arrogant. There is a big difference between valuing ourselves and arrogance. Someone who is arrogant looks down on others from an inflated belief in themselves. Valuing ourselves has nothing to do with comparisons. It is literally knowing who we are and valuing what we have to offer the world. We are all important. We are all worthwhile. We all have things to give to the world. So for this week here are a few questions for you to ask yourself. You may find it helpful to jot down your ideas so that you can look back on them over the coming weeks. Most importantly really be aware of your first thoughts after each question. Don’t filter out anything for an answer you find more acceptable. There is no right and wrong (or good or bad) when exploring your inner world. Do you have any fears about having more self-worth? Don’t get too big for your boots! We don’t need your ideas, thank you very much! All of these statements tell us in one way or another to not be ourselves, to follow the rules and not count our feelings. The more we heard these things the more we will have internalised anxieties around being who we are. Of course, each family sends their own set of messages in their own unique way. What messages did you receive about valuing yourself, your thoughts, feelings and opinions? It is worth exploring any ideas we have been given about self worth. Some may have been useful and some may have been limiting, like the statements above. Where we have received limiting messages, we need to address them with our adult perspective, challenging their validity. When we do this we stop inadvertently holding ourselves back. Where in your life do you value yourself and where don’t you? This is a question for you to identify your particular situation. It may be that you have a lot of confidence at home but rarely speak up for yourself at work. It may be that you never put yourself first or speak up for yourself. Some people present an outward confidence but don’t feel it within. If you are unsure then just move on. Within the next weeks more will be revealed as you go through each topic. How would things be different if you valued yourself more? If you can begin to imagine how things will be different for you that is wonderful because using our imagination starts engaging our mind with how we would like things to be. This is when real change begins. Again , if this is a challenge, move on to next week and allow this process to unfold. We will come back to these points later on. If you are excited by the prospect of this challenge please tell your friends. It is a great thing to do and be able to share with those who care for us. These journeys are often very personal. I would, of course, love to know any aspect of your experience with this challenge that you would like to share with me. I always respond to all comments. 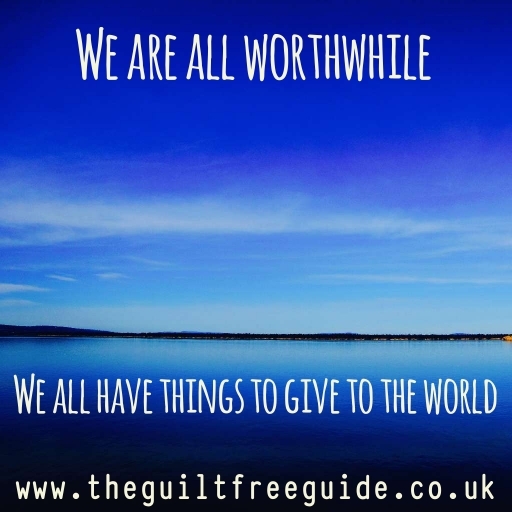 And finally, click on the button below to keep up to date with the latest articles and offers from The Guilt-Free Guide AND receive your FREE guided visualisation ‘Mother Moments’ especially designed to give you some time for you to focus on yourself. < Previous Are You The Family Coordinator? It is a wonderful thing for your Mum to acknowledge. Learning is life long for all of us. Embracing that is great. Thanks for commenting. Thanks Rob. Valuing ourselves is so important and being able to acknowledge our strengths fully, takes us a long way in life. thanks for your comment. Have a great weekend. I firmly believe in being a strong, positive example for our children. We are their best teachers. It is so important to exude self worth. I feel as though the older I get, the more I love myself which in turn helps me build confidence in my children. I try to teach them that being a good person and loving who you are is more important then what others think of you. Thank you so much for linking up with #momsterslink. Hi Sarah. I don’t know if it is a fear in British society or a general one but it is certainly there. Arrogance is something other than self worth. I am glad you liked the idea behind my series of posts. It is always an uncertain time when doing something new like this. Lovely, important, and worthwhile words. Thanks for sharing. Jennifer recently posted…Friday, it’s Friday! Thank you Jennifer. I am glad you could see the value in it. Thanks for commenting. You are spot on here Becky. No one can tell someone to have it. Self worth is an individual journey and we all have different starting places. Thanks for your insightful comment. Great post and reminder to be YOU! Love this summer challenge! Found you from Manic Monday link up! It isn’t a very British thing is it! Stiff upper lip and be self deprecating. But I agree it is an important thing. If we can get hold of our talents and utilise them then everyone benefits. Thanks for your kind words and comment Em. I think this is fantastic and wonderful of you to share with us all. I think self worth is definitely something many many people struggle with, although not all would admit I’m sure! Thank you for your supportive words. My experience is that we can all benefit from having a look at what we feel about ourselves. Self development is not a one time journey, it is constant. As you will see in future weeks although I have done a lot of work on myself over the years, just in writing these posts and doing the work myself I have developed even further. Great post – as mothers we can definitely do with learning to value ourselves more. And I do think it is very important to parent by example too. A great thing to be reminded of at the start of the holidays thank you! Such an important topic and one that we moms don’t always consider enough. Thanks for linking up at the Manic Mondays blog hop! This really was an interesting read and an interesting topic. I think it is very important to value ourselves. These are such important reminders. I think there’s an especial challenge for women, in our role as nurturers, to be able to value ourselves. I think the important thing to remember is that valuing ourselves doesn’t equate to putting others down. It’s not a competition. This post comes at a pivotal time for me. While I know that my immediate team and my boss value me, it’s been a fight to maintain my sense of professional self-worth in light of things going on in the larger organization. Also, my ex-husband is going through a third divorce in three years and blames me – and so is actively trying to undercut my sense of confidence in my parenting. It takes a lot of work to maintain confidence in that environment, and I appreciate the reminder to do the work. Thanks for linking with #TwinklyTuesday.